Hope everyone is safe and sound from Hurricane Sandy! We're doing a-okay out here in Brooklyn. Our thoughts and prayers go out to all those affected by the storm. 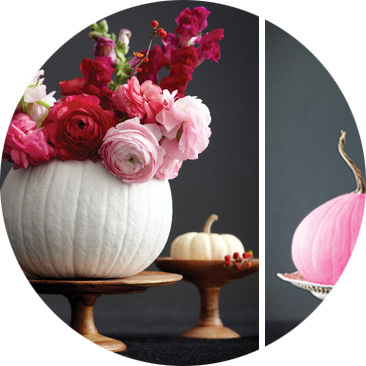 With tomorrow being Halloween, it felt appropriate to have a tablescape post with pumpkins! Look at these cuties ... the color blocking and the various heights on the candlesticks are adorable. And that flower arrangement is perfection. Gotta love the non-traditional usage of ordinary items!